A major landmark in the recovery of British Railways from the depredations of the Second World War was the completion of the Manchester-Sheffield- Wath electrification scheme in 1954. Originally proposed by the Great Central Railway in pre-grouping days, the project had been examined by its successor the LNER, shelved, and then revived in 1936. Work began three years later but was of necessity suspended in 1940 following the outbreak of war. The Pennine electrification cost £15 million and was the first in Britain where all traffic - passenger and freight - was electrically hauled. Its primary objective was to ease movement of the heavy coal traffic across the Pennines, but there was also an extensive passenger service between Sheffield and Manchester with through expresses from Marylebone. 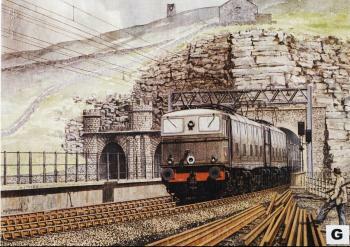 At the Manchester end, the Dinting to Glossop branch was electrified too, offering a much improved commuter service. The scheme was also the first to use electric locomotives for all main line traffic. A total of 65 new electric locomotives replaced 110 steamers - the first practical indication of the motive power economies possible with a form of traction that was available at the turn of a switch, and could be on duty almost continuously 24 hours a day, seven days a week. Two basic types of electric locomotive were built: 58 Class EM1 Bo-Bos of 1868hp for freight working, and seven 2490hp Class EM2 Co-Cos, all of which later bore highbrow Greek Goddess names, for the passenger trains. The major engineering project on the line was bypassing the notorious Woodhead Tunnels whose elegant castellated portals were each the entrance to a choking hell-hole for engine crews. The twin bores, dating from 1845 and 1852, had long been infamous for bad ventilation exacerbated by the fact that from both east and west the lines rose steadily and steeply to a summit within the tunnels. This, combined with a deterioration of the fabric which had made maintenance expensive and insufficient headroom to accommodate the overhead equipment, led inevitably to plans for a new, single bore tunnel. Costing £4.25 million, the new tunnel proved to be one of the most monumental railway works undertaken this century and it took six years and as many lives to carve it through the unyielding Pennine rocks. Here two Class EM1s slip silently out of the new Woodhead Tunnel double-heading a westbound coal train. Fast, clean and efficient - to say nothing of a sight more pleasant for the driver - the train is a mobile demonstration that the future for Britain's railways lies with electrification. Sadly, it did not lie with this electrification, however. Built to the pre-war standard 1500 volt dc system abandoned in 1956 in favour of 25kV ac for all subsequent schemes, it also presupposed traffic levels, both passenger and freight, would stay the same. They didn't, and today the route through the Pennines is closed. Now the original Woodhead Tunnels - which lasted a century - have been joined by the new tunnel- which was in operation for less than a third of that time - to lie abandoned and derelict with only the ghost trains passing through.